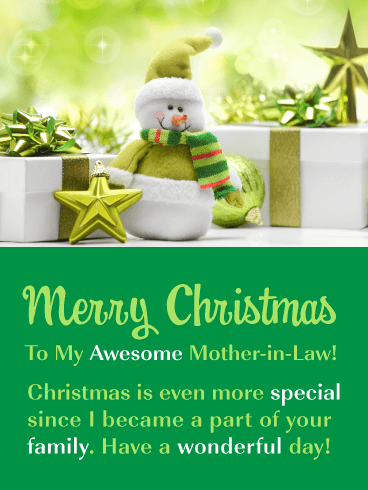 If you have a special relationship with your mother-in-law where you also consider her your friend, then this Christmas card would be perfect for her! It contains a thoughtful and heartwarming message that thank her for all the laughs and great times! This Christmas card was designed with a beautiful image of 3 wonderful decorative stockings hanging over a fireplace mantel. She is going to love this holiday card so be sure to send it out soon! These holiday cookies look perfect and your mother-in-law will think so too! This is why a Christmas card such as this would be great to send to her during the holiday season. Cute cookies in the form of gingerbread men, snowflakes, Christmas trees, and houses, give this greeting card a very festive look! 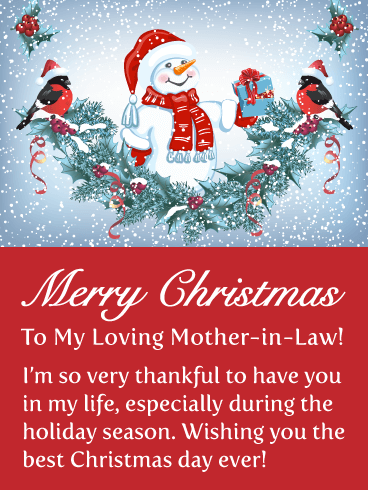 Wish your mother-in-law a sensational and absolutely wonderful Christmas day with this special holiday card today! 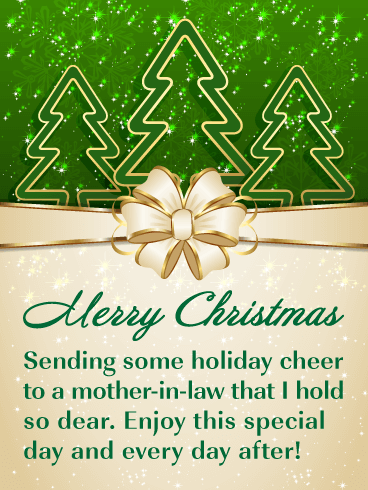 Send an exceptionally beautiful Christmas card to your mother-in-law this year to let her know you are thinking of her. This gorgeous holiday card displays stunning golden Christmas ornaments that will capture the attention of anyone who sees them. 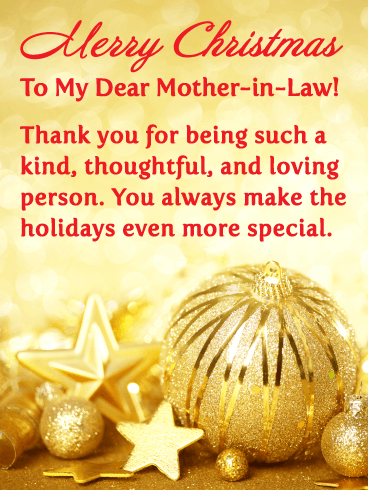 The message expresses that you feel your mother-in-law is a thoughtful and loving person. This alone will make her Christmas extra special. This Christmas card showcases sweet chocolates that were designed to have a special holiday look, making them perfect to send during the holiday season. 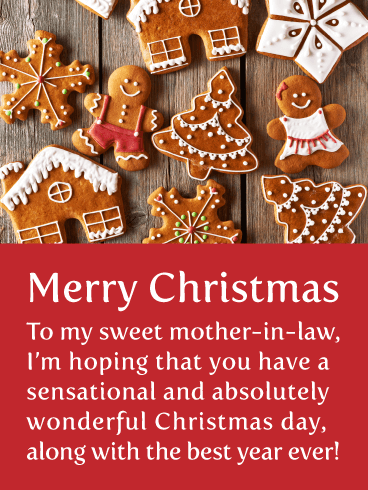 Additionally, the thoughtful message this Christmas card displays will wish your mother-in-law an outstanding day filled with joy, love, and of course, special treats! Don’t make her wait a minute longer, send these Christmas chocolates over to her today! 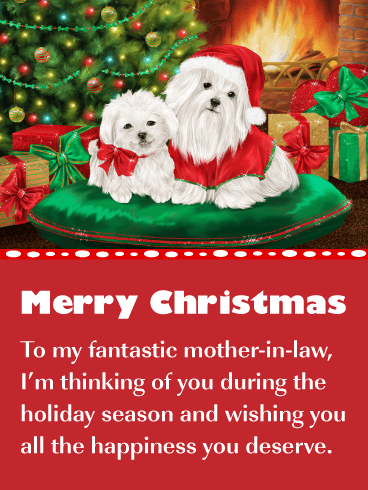 If your mother-in-law likes dogs, then she is going to just adore this charming Christmas card! It contains two sweet puppies that are posing for their holiday photo. So adorable! A perfectly decorated Christmas tree can be seen in the background, as well as colorful gifts with beautiful bows. So send these holiday puppies over to meet your mother-in-law in time for Christmas day. She will certainly appreciate it! This Christmas card was designed with an adorable kitten wrapped in a sparkling red Santa hat as it sleeps. It’s too cute! It also features an exceptional glittery green background, and a Christmas tree with red sparkling ornaments. It looks fantastic! 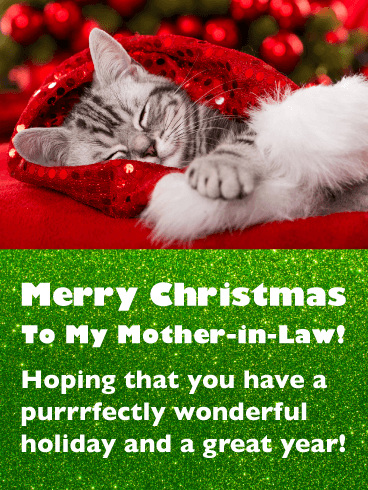 The message will make your mother-in-law smile when she reads you are wishing her a purrrfectly wonderful holiday. Send this sweet holiday card over to her today to wish her a Merry Christmas! 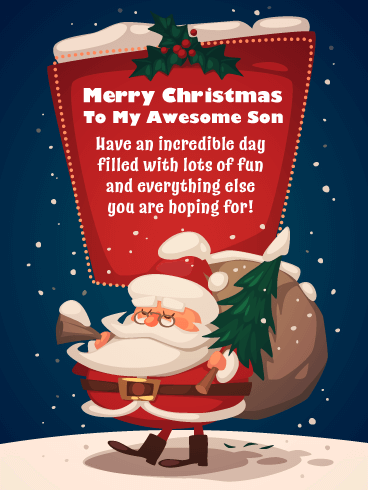 Let Santa wish your son a Merry Christmas with this cute holiday card! Santa is seen carrying his bag of presents, along with a little Christmas tree, and he is ready to make his deliveries! The fabulous red sign holds a message that will let your son know you hope he has an incredible day filled with fun! 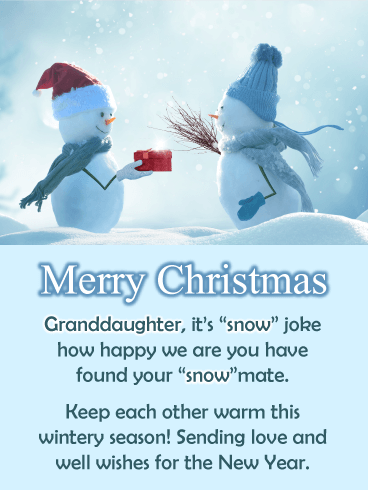 This endearing Christmas card will put a smile on your son’s face, so be sure to send it out today! 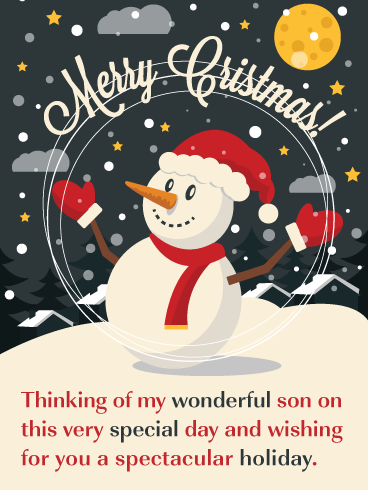 Send your fantastic son a Christmas card that will brighten his day! This special greeting card features Santa, Christmas presents, and a holiday candle. It’s perfect! The message expresses that you appreciate all that your son does for the family, and that you love him for who he is. So sweet! 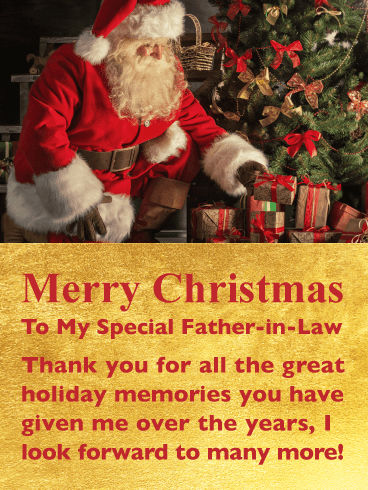 Your son is going to really enjoy receiving this awesome Christmas card! 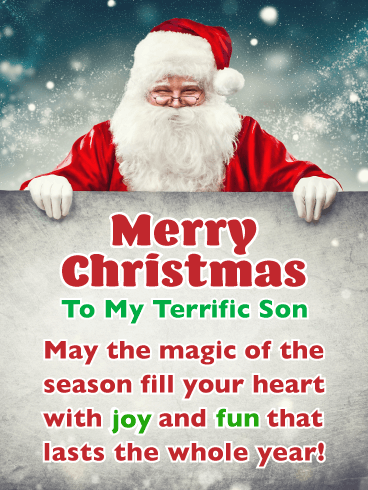 This Merry Christmas card would be perfect for making your son’s day a little brighter. It showcases glimmering letters that form the phrase Merry Christmas and bursting stars can be seen shimmering all around. It looks fantastic! 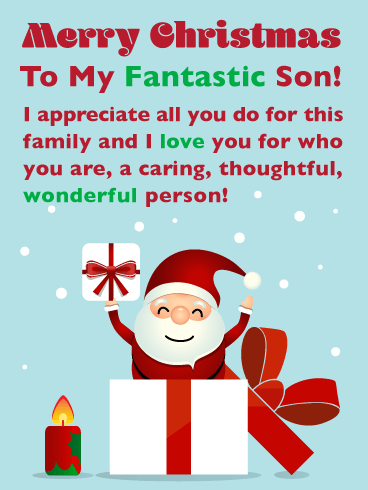 This Christmas card expresses that you are thankful to have such a special son, and he will be so happy to read this on Christmas day! 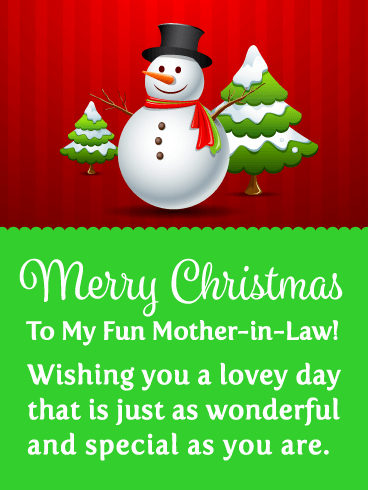 This eye-catching Christmas card will allow you to wish your son a day filled with joy and fun! A classic Santa is surrounded by falling snow and dressed in his traditional red and white Santa suit. He looks fantastic and represents this joyous holiday that has arrived. 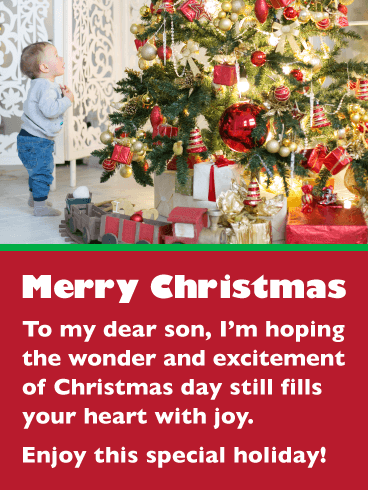 Send this cheerful Christmas card out to let your son know that you hope the magic of the season fills his heart with joy and fun, he will certainly appreciate it. Young or old, everyone loves cookies! This Christmas card is a favorite among many because of its fantastic display of holiday cookies that are in the shape of a candy cane, a Christmas stocking, and of course, the letters that spell Merry Christmas! It also has caring words that were written just for your son that lets him know that you love him very much. Be sure to send this special Christmas card to your son today! This exceptional Christmas card has a fun and modern look. It showcases dazzling words that say ”Merry Christmas” with glittering lights strung across the letters. It looks amazing! Below the words, you can see Santa delivering his gifts. 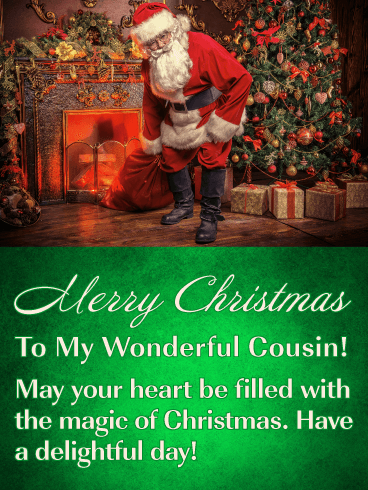 Your cousin is going to love this Christmas card! 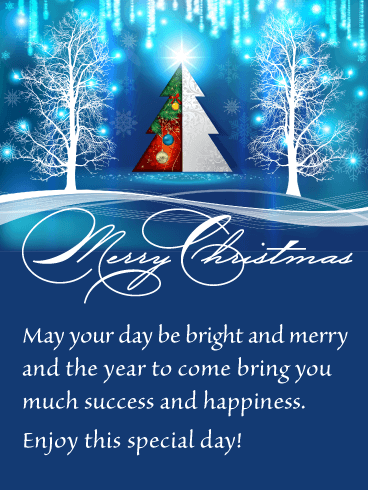 The message expresses that you are sending extra cheer and that you are wishing them a wonderful Day! 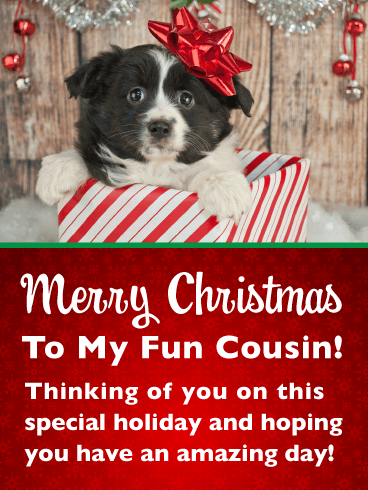 Send this marvelous Christmas card out to your cousin today! 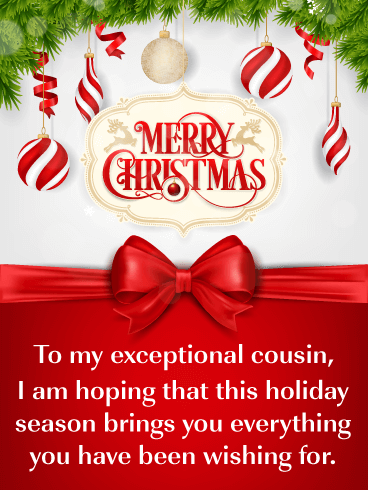 This Christmas card is fabulous and would be perfect for sending to your cousin! It showcases beautiful and elegant Christmas presents sitting near a real Christmas tree. It also features stunning shimmering red and silver ornaments. 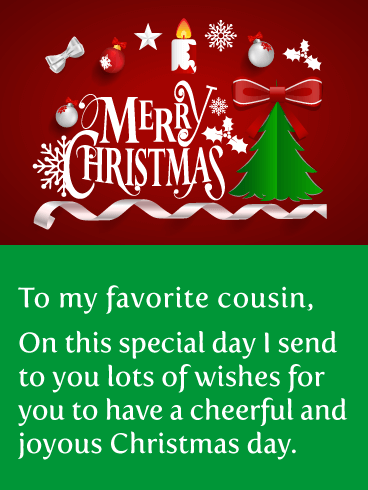 The message expresses that you are sending special holiday wishes so that your cousin will have a fantastic day. So thoughtful! 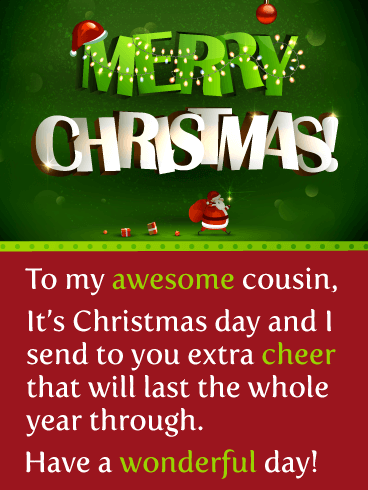 Send this Christmas card out soon so your cousin can enjoy these outstanding gifts on Christmas day! Christmas is a wonderful time of the year, filled with hope, wonder, and a little holiday magic. This Christmas card captures the essence of the magic of the holidays by featuring the most beloved Christmas icon of them all, Santa Clause! 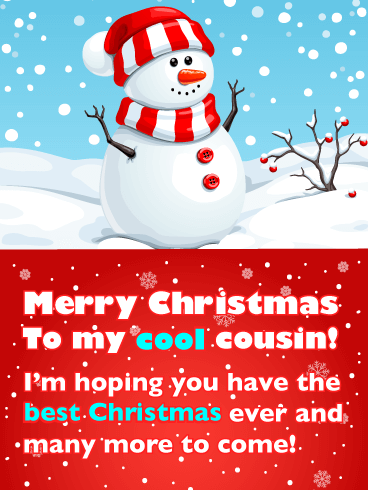 This charming image looks sensational and will warm the heart of your cousin. 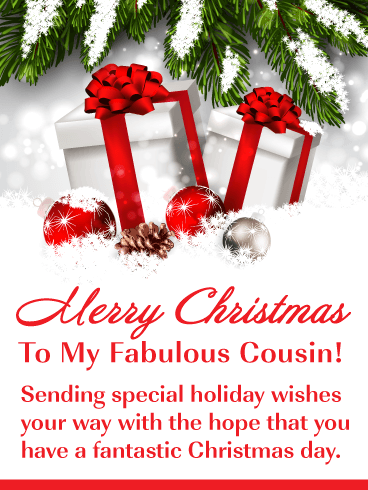 Wish your cousin a delightful day by sending this beautiful Christmas card without delay! 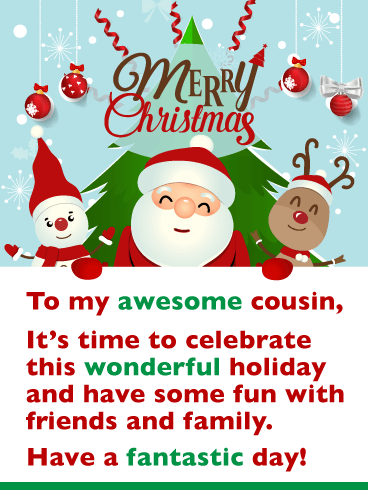 Send special holiday treats over to your cousin, it will be greatly appreciated! 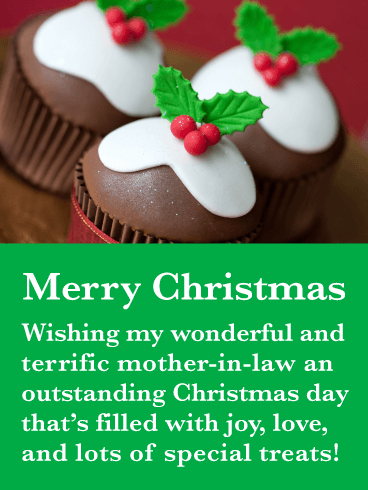 This delicious Christmas card features very special Christmas cupcakes! They are held in decorative cupcake holders and topped off with frosting and sprinkles. They’re irresistible! 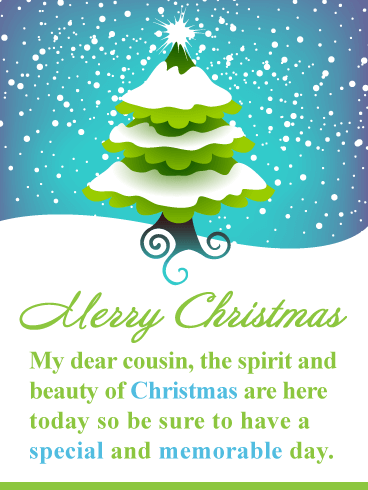 A splendid Christmas tree is seen in the background and gives this card a festive look. 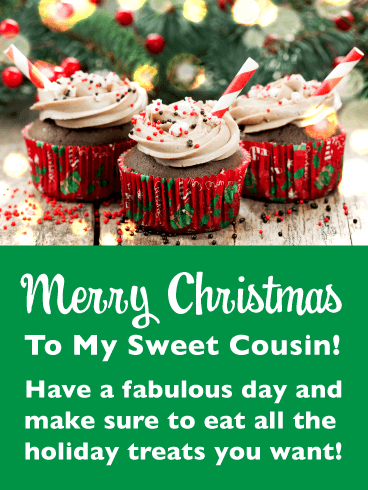 The message will let your cousin know it’s time to eat all the holiday treats he or she wants! Send these Christmas desserts soon before they are gone! This fabulous contemporary Christmas card has been designed with artistic Christmas trees that contain wonderful patterns and colors. It gives this holiday card a modern and stylish look! 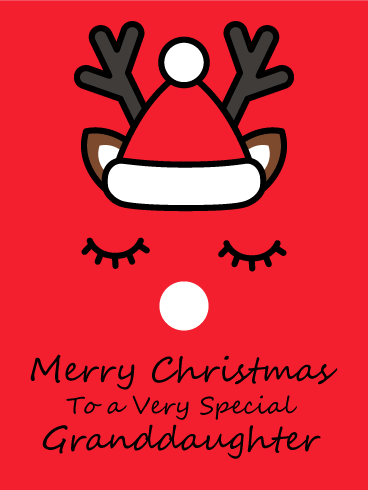 The jolly Santa’s red-colored suit gives this contemporary Christmas card a splash of color that looks sensational! Send this winter wonderland scene over to someone today to wish them a magical and jolly Christmas without delay! Granddaughters are such a joy. They keep us laughing and smiling with their jokes and good natures! 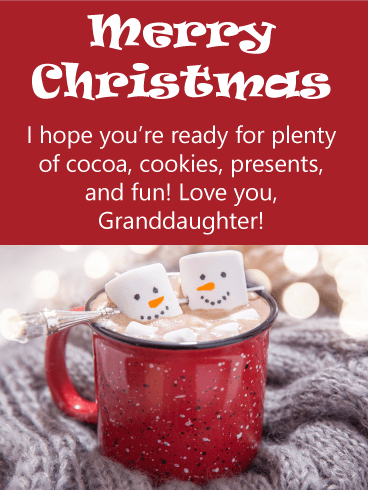 Send your precious granddaughter this silly Christmas card to let her know how much you enjoy having her goofy self around, especially at the holidays! The girl portrayed on the card is wearing a festive Christmas sweater and smiling while pulling a Santa hat down over her eyes– it’s hard to look at it without feeling the spirit of the season! There’s no one you enjoy spoiling quite so much as your wonderful granddaughter! 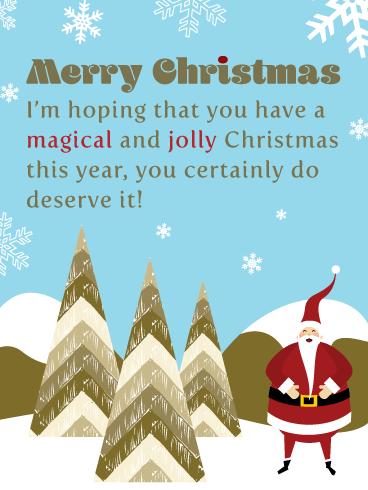 Send her this adorable Christmas card to wish her a Merry Christmas and get her excited for the incoming holiday fun! The happy, little marshmallow snowman soaking in a steaming mug of hot cocoa is sure to make her giggle with glee and feel the warmth of your love! Oh the weather outside is frightful, but this holiday card is so delightful! 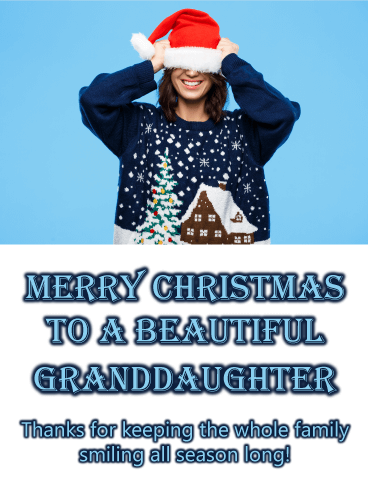 Send your dearest granddaughter this beautiful Christmas card. Breathtaking snowflake details fall gently over a pile of tastefully wrapped Christmas gifts surrounded by candy canes, cinnamon sticks, and tree branches. The thoughtful wishes will warm her heart and put a sweet smile on her face when she reads them. Sometimes simple is best. Like with this minimalist style reindeer cartoon! A Santa hat, antlers, eyelashes, and a big, red nose! This reindeer couldn’t get any sweeter! 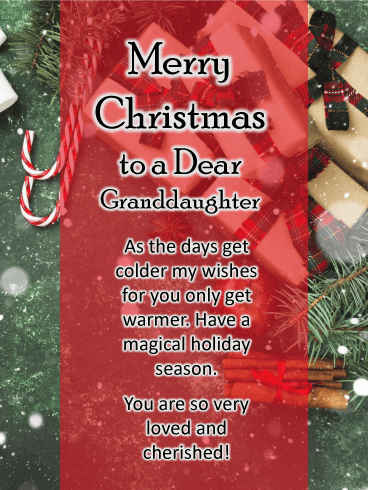 Your darling granddaughter will love receiving this thoughtful Merry Christmas card, all you have to do is send it! Make the season brighter by sending unique holiday cards like this one to all your loved ones! Your granddaughter is near and dear to your heart. And now she’s added to the family by marrying the man of her dreams! 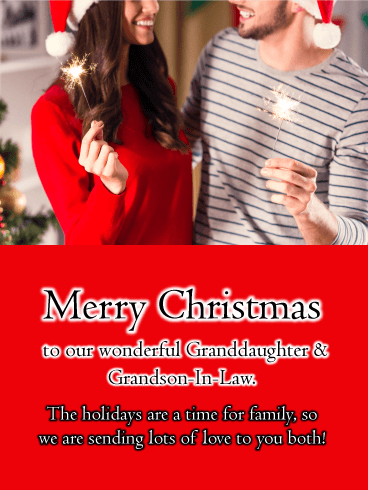 Send your love to both of them this holiday season with this beautiful Christmas card for both granddaughter and grandson-in-law. A young couple wearing matching Santa hats smile from the front of the card while holding celebratory sparklers. 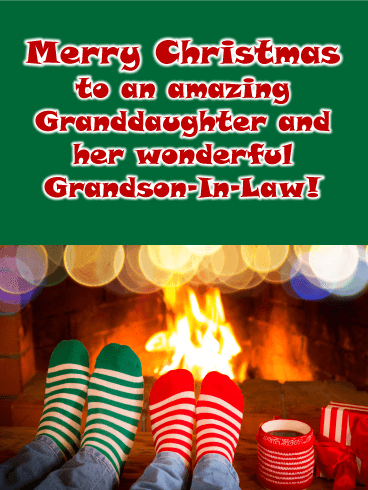 Looking for a holiday card for your sweetheart of a granddaughter and don’t want Grandson-In-Law to feel left out? We’ve got you covered! Send those wintertime lovebirds this extra cozy greeting card to encourage them to cuddle up and stay warm! 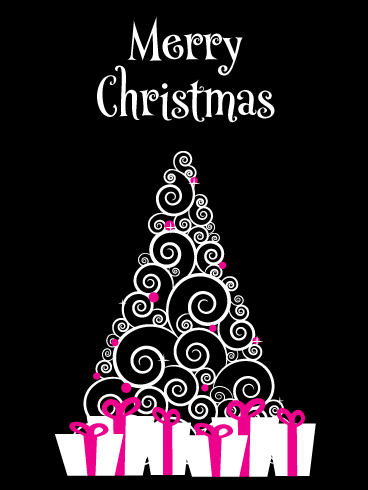 The roaring fireside, matching striped Christmas socks, and a cheerful font really make this Merry Christmas card POP! 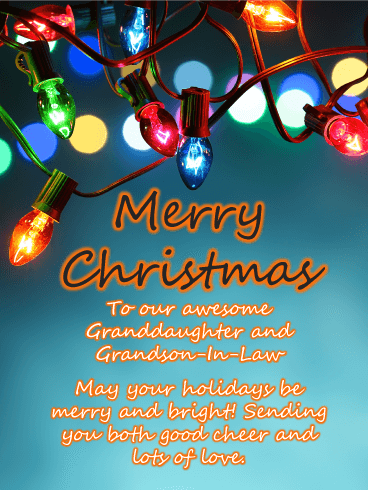 Light it up this holiday season by sending this colorful string of lights Merry Christmas card to your Granddaughter and awesome Grandson-In-Law! With funky greens and glowing oranges, this isn’t your average Christmas card, it’s a little wilder - like your relatives! 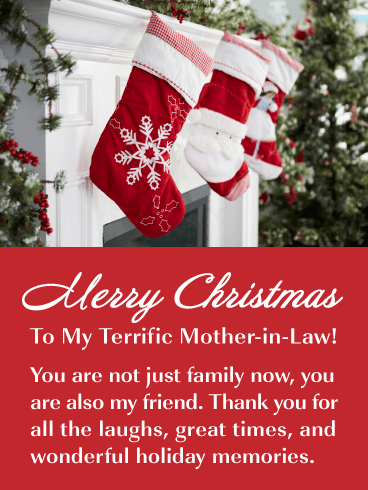 Of course, the message is still one of heartwarming holiday cheer and will make your granddaughter and her man feel good inside when they read it!